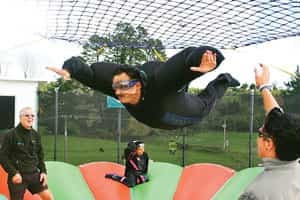 Umar tries his hand at flying in the ‘freefall Xtreme’ at the Agrodome Adventure Park. Why New Zealand? Was it The Lord of the Rings (LOTR) effect? Not at all. Every year, my family and I go on three holidays—two in India and one abroad. The one abroad is decided very simply: We look at the continents we haven’t visited and take a call. We hadn’t been to Australia at all, so that helped make up our minds. Now, only South America remains to be explored. How did you draw up your itinerary? We have perfected a pretty effective way to shortlist what we want to see: We trawl the Internet, source brochures from multiple agents, talk to people and always zero in on the destinations recommended by one or two people—besides, of course, the more obvious places. That way, we’re sure of travelling to the less “touristy" places, besides the regular attractions. This is because we are more focused on outdoor adventures and wildlife than sightseeing. The journey from Bangalore must have been long. We stopped for a night in Singapore and also spent eight days in Australia, taking in the theme parks in Gold Coast, doing an excursion to the Great Barrier Reef, going on a hot-air balloon ride in Cairns and spending two days with dolphins at the Tangalooma Dolphin Island. But we were still hungry for more in New Zealand, which accounted for the bulk of our holiday. Umar Teekay with daughters Salma (in the middle) and Khatija in the ‘swoop’ I guess Auckland was your gateway to New Zealand. That’s right. This is New Zealand’s biggest city—of its 4.5 million population, 1.5 million live in Auckland. We arrived in the afternoon and spent the next day sightseeing and on a cruise of the Inner Harbour. The highlight, though, was the Sky Tower jump—this involves walking out on a ramp and jumping into the void, though of course a hook keeps you from killing yourself! One has to take the plunge, literally, without thinking—I stood at the edge of the ramp for too long and had to wait for a second count of 1-2-3 before I threw myself off. It’s an amazing feeling: One goes down about 190m but, unlike a bungee jump, one is upright and more or less still and able to enjoy a panoramic view of the city. My elder daughter Salma, too, did the jump; the younger one was denied the experience because of a height restriction. The next day, we drove to Waitomo, where we did a guided tour of the famous Waitomo Caves, which have these spectacular limestone formations, followed by an unrivalled boat ride through the Glowworm Grotto, lit up by thousands of glow-worms clinging to the roof. Afterwards, we stopped at a rabbit-shearing farm—the shorn rabbits look really pathetic—and went on to the Rainbow Springs Nature Park at Rotorua, where we got a first-hand feel of New Zealand’s unique flora and fauna—this is where we saw our first kiwi. This was followed by a visit to the Whakarewarewa geothermal valley: the Pohutu Geyser here erupts up to 30m in the air. Dinner was at the Tamaki Maori cultural village, a banquet of foods cooked traditionally on hot rocks in an earthen oven—but it was rather bland for our tastes. In fact, the food was the only unexciting part of the New Zealand holiday. There are quite a few thermal springs in Rotorua, aren’t there? 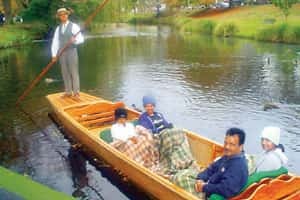 All cosy: (left to right) Khatija, Zubaida, Salma and Umar go punting in Christchurch. 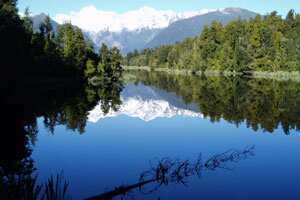 New Zealanders are very protective of their environment, especially their water bodies, so the lakes are really clean. I saw it up close—I did a 60ft bungee jump on the Waikato river, which involves a quick dip in the river before one is whisked away on a boat. We also went jetboating to the Huka Falls. But the most exciting element of the holiday was saved for the next afternoon, after a sheep show at the Agrodome Adventure Park. This is something called Freefall Xtreme, which gives you the experience of flying, if only for a few seconds. Basically, they use a very high velocity machine rigged up with a plane propeller to create a wind tunnel that bears you up. Our instructor could stay up to three to five minutes in the air, no strings attached, but we could manage only a few seconds each. We also tried rolling down a hill in a ball—called a zorb—partly filled with water and riding downhill at breakneck speed in a luge. Both experiences were great fun. From North Island to the South, was there any drastic difference in landscape? It wore us out, more so because we had a day trip to Milford Sound planned for the next day. But the route was very beautiful, along the lakes Wakatipu and Te Anau, past areas where the sea had invaded the land with the most picturesque results. We also packed in a one-and-a-half-hour cruise of the Tasman Sea. The next day, we had recovered enough to go for an LOTR tour. I thought you weren’t fans? We aren’t. We went along for the tour in a four-wheel drive with a Japanese couple more for the nature than the movie associations. There were no roads in these places, just mountain and forest. And because there are no predators in New Zealand at all, not even snakes, it was completely safe to venture into the woods. These included the sites for Lothlorien, home to the Elves, and Isengard, Saruman’s abode in the movie. This was natural beauty at its best: Clear blue skies, snow on the mountains—though we would have more of that shortly. First-hand experience of snow? How? We were given metal spikes and a guide but, make no mistake, one wrong step and one could disappear without a trace. The region had experienced fresh snowfall just a while before, so we had to be careful about stepping into the footsteps created by the person preceding us. At one point, my wife and I got separated from the rest of the group; at a crossroads, we saw them on the left, and followed. But I looked out over the right and there was a sharp fall right there—there was no sign, no rope to hold on to, nothing. That’s extreme. How did you recover from that experience? Well, the train journey the next day was memorable—and safe! We travelled by the TranzAlpine Train from Greymouth to Christchurch—one coast of New Zealand to the other. It’s supposed to be among the most scenic train journeys in the world. It crosses the fertile farmlands of the Canterbury plains, passes through massive viaducts and spectacular river gorges and the stunning Waimakariri river valley. At 737m, the alpine village at Arthur’s Pass is the highest point. That sounds like one fulfilling holiday. It was. But if there’s ever a next time, I would like to tour New Zealand without an itinerary. I think just driving through the country, past the pristine water bodies on one side and the snow-capped mountains on the other, and staying at any of the hundreds of picturesque motels that dot the countryside is the best way to see the place. Though the European countryside, too, is pretty, it seems manicured next to New Zealand’s raw charm. I would skip North Island altogether, except for Rotorua, and concentrate on South Island. Cathay Pacific connects New Delhi and Mumbai to Auckland with two stopovers; current return economy fares start from around Rs1.68 lakh and Rs1.16 lakh, respectively. Singapore Airlines flies from Bangalore; fares start at Rs72,000.